Wed 27th - After a 12 hour flight we arrived in Sao Paulo at 06.20, then met with our tour Guide Naun Silva to catch a domestic flight to Brasilia. After checking into our hotel we went on a city tour of Brasilia. Initially, the roads were heavily congested as everyone had the afternoon off to watch Brazil play in the World Cup and they were all driving out of the city. However, by 3pm the roads were empty so we had no traffic jams! Thurs 28th - Our 9am flight to Barreiras arrived at 10.35. Barreiras is one of the fastest growing cities in Brazil as they are largest producers of soya, corn and cotton. Our 4 hour drive north covered 290 km with a stop midway. We then switched to an open-topped, four-wheel-drive truck for a one hour journey (13km) along a dirt and sand track which wound its way past several small farmsteads, to arrive at SouthWild Wolf Camp bordering the Paranaíba Headwaters National Park. Upon arrival at the camp we sat at a feeding station and watched the marmosets, two woodpecker species and several tanagers. The owner of the camp feeds them with bananas and guava. In the evening we had a surprise visit from a young maned wolf. Fri 29th - We set off at 6.30pm on a 5 minute drive to visit a Macaw ‘hide’ where we were treated to views of 20+ Hyacinth Macaws as they foraged for palm nuts, which have a very hard shell that only these macaws can break thanks to their incredibly strong beaks. The nuts are provided by a local person. Back at the camp we then went on a 1 hour nature walk but didn’t see much as it was nearly the mid-day heat. Leaving at 3pm we drove to SouthWild Wolf Cliffs Camp, seeing Burrowing Owls en route. Early evening, after sunset we saw a large female Maned wolf. The wolves approach the camp, tempted in during the dry season by morsels of chicken. Time seemed to stand still as we enjoyed this special encounter - she stayed for a long while and everyone enjoyed incredible views, before she ambled back into the night. The two SouthWild Camps are owned by Lourival – the Valley Camp is 880hectares and the Cliffs is 4100 hectares and his family also own the 33 hectares of land where the nut cracking capuchin monkeys live. Sat 30th - We departed at 7.30 am for a 2.5 hour drive in search of birds and animals. Amongst other birds we also saw the blue and gold macaws. At 3pm, we departed to return to the SouthWild Wolf Valley Camp where we had a surprise visit from 2 young maned wolves, each arriving and departing in different directions. Even the camp owners did not know there were 2 maned wolves in the area. Sun, 1st July - We left at 6.30am to drive back to the main road then on a dirt track for a short distance. From here we had a gentle uphill walk of around 10-15 minutes through the forest, until we reached an open shady area. We were joined by a local guide who started calling into the forest, and soon afterwards the faint call of primates could be heard, slowly getting closer, until the first of many inquisitive Black-striped (Bearded) Capuchin Monkeys showed themselves. No sooner had they arrived, than they started cracking nuts right in front of us! We were mesmerised as some individuals carefully placed a palm nut on a large flat rock and found smaller rounded rocks to hammer the nut. (see the Other Mammals page) Back to camp for lunch and then at 3pm we went back to the ‘hide’ to see the Hyacinth Macaws in the evening sun, and then watched the birds at the feeding station. Mon 2nd - The day started at 06.30 for a 2 hour pre-breakfast bird walk when we saw the rare, elegant Helmeted Manakin, 4 toucans, various macaws and many other colourful and large birds. We left at 10am for the 4 hour drive back to Barreiras, stopping midway for lunch. We then endured a very stressful few hours. We had 2 flights to take and were aware of a tight connection time. The first flight Barreiras to Brasilia was due to depart at 17.55 and arrive at 19.25. However, it departed 40 mins late and arrived at 20.10 – so tight that we had less than 1 hour to disembark, collect luggage, check into next flight to Cuiaba and get to the gate. The next flight was at 21.10. Our guide ran to the check-in to ask them to delay the flight whilst we arrived as a group with all the luggage. Apparently, this flight was 20 mins late so we managed to check in, get to the gate, and even have a glass of wine! It was nerve wracking but, as a team we all managed it. Tues 3rd - We left Cuiabá, the capital city of the Brazilian state of Mato Grosso, for a 2hr drive (100km) into the Pantanal to the next lodge. After 1hr 30min of driving we arrived at the last major settlement of Poconé and after another 30 minutes and having passed under the iconic entranceway to the Pantanal, which is marked by a huge wooden sign that reads ‘TRANSPANTANEIRA’, we transferred to a custom-made open-sided safari truck. We stopped to see an anaconda that was being taken out of the water by an Herpetologist (snake expert), who happened to be in a tour group! We approached our next lodge, the Pouso Alegro at a slow pace, enjoying the variety of habitats that the driveway meanders through. 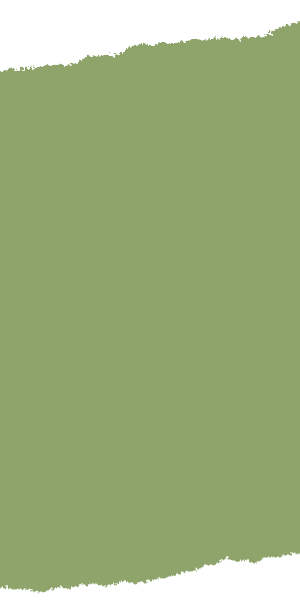 Of note were the large numbers of Yacaré Caiman. We would spend many of the coming evenings and early mornings on this productive stretch of track, and would have many memorable sightings along the way! Our first wildlife-spotting drive in safari vehicle was at 3.30pm, and after a sundowner we then had a 1hour spotlighting drive back to the lodge. We saw number 2 of our ‘Big Five’ - the Brazilian tapir easily recognised by its distinguishable nose. We saw many other mammals and birds. Wed 4th and Thurs 5th - Our days started at 6am for breakfast, a nature walk at 6.30am and then at 8am a safari in the open vehicle. At 3pm we headed out in the safari truck for a late-afternoon drive. As the golden evening light faded fast we stopped for a sundowner followed by 1 hour spotlighting drive. We came across another highly sought-after mammal species which is another of South America's mammal gems – the Lesser Anteater or Tamandua. The large congregation of Yacaré Caiman in the famous pond were a delight as hundreds of eyes reflected our strong spotlight, whilst Greater Fishing Bats skimmed the calm waters. 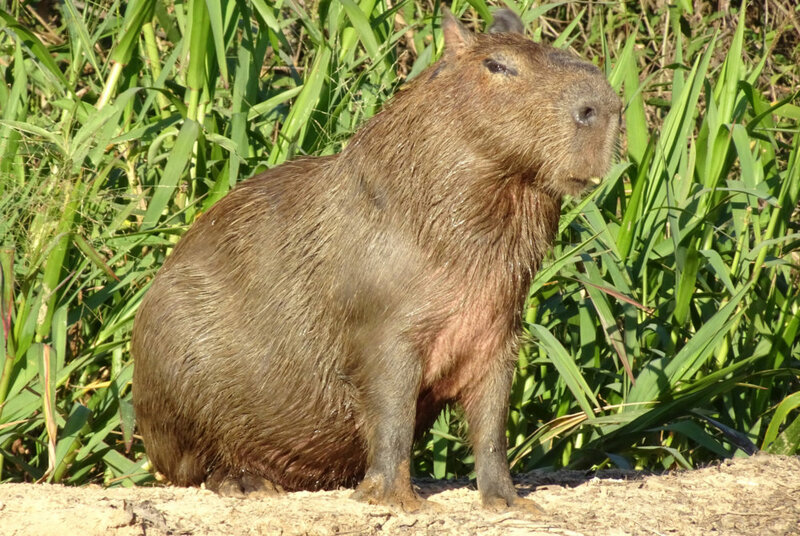 Alongside the pool we saw several Capybara, who offered unbelievably close-up views. One evening, we were surprised to see a giant anteater wander into the camp – what an amazing animal with long snout and thick droopy hair tail! – that’s number 3 on our list of the ‘Big Five’. Fri 6th - We left before sunrise and slowly made our way down the driveway for the last time. We were soon back on the main Transpantaneira for a 6 hour drive (including bird stops and comfort breaks), heading further south to our next lodge. Along the way we passed a cattle drive – the local rancheros moving large numbers of Brahma cows to fresh pastures. It was on one of the bridges that we spotted 2 large Giant River Otters swimming in a pool of water directly below us. It was fascinating to watch this master of the water, moving with such ease, diving and resurfacing at will. Whilst stopped we also saw some young cubs in the reeds under the bridge – that’s number 4 on our list of the ‘Big Five’! A little way before reaching the small river port village of Porto Jofre, we passed through a flat swampy area which proved excellent habitat for Southern Screamer – a large prehistoric looking bird. The sleepy fishing village of Porto Jofre marked the end of the Transpantaneira – for the next four nights we would be on the water at the fantastically located Jaguar Suites Flotel - – a floating lodge in the heart of an area which holds the largest known concentration of Jaguars anywhere in South America! After checking in to our suite in the Flotel we set off in our comfortable, quiet motorised boat that afternoon and were soon searching the various rivers and creeks of the area for wildlife. We were in search of jaguars and we found one – a 2 year old female called Amber – she was the last on our list of the ‘Big Five’. The air was full of joy as we quietly absorbed the magical first Jaguar sighting. Mission Accomplished!!! There are strict rules in this area and, having savoured the Jaguar for the best part of an hour, we had to return to the comforts of the Flotel before nightfall. An evening lecture followed dinner, by one of the resident biologists who study Jaguars and other wildlife of the area. A great first afternoon and evening had by all. Sat 7th to Mon 9th - Following a hearty breakfast we were soon back out on the river every morning between 06.30am and 11 am for other wiildlife excursions on the rivers Cuiabá, Piquirí, and the Three Brothers. 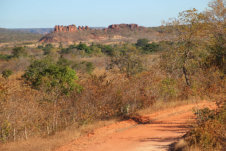 Our afternoon excursions were from 2.30pm to 6pm with a stop for sundowners soon after 5pm. We were fortunate to have 12 sightings of Jaguars over the 4 days, albeit 5 jaguar, known as Mick Jaguar (14 year old, large male), Jeff (Male), Amber (2 year old female), Ginger (2 year old female, sister of Amber) and Patricia. We had several sightings of Giant River Otters and watched as they played and caught fish. Yacare Caiman are the prey of Jaguars and there is certainly an abundance of them in the area. Also there are many packs of capybara. We journeyed down some small channels, and enjoyed excellent views of Green Iguana and a tiger heron in the nest with her 3 fluffy chicks. Tues 10th - Having spent four incredible nights on the Flotel, it was sadly time to move on but not before one last boat excursion and a good lunch. We then travelled 15km downstream to Porto Jofre at the end of Transpantaneira to rejoin our safari vehicle. After a 3 hour journey we arrived at the SouthWild Pantanal Lodge where we would stay for the night. There was time to explore the immediate surroundings, including the impressive viewing platform that overlooks an active Jabiru stork nest, which offers incredible views of this iconic bird. We also saw in excess of 30 capybara and some Yacare caiman and many birds that visit the feeding stations. The beautiful and wildlife-rich Pixaim River flows directly past the gardens of the lodge. It's an idyllic setting and a fitting location in which to spend the final night of the tour. Having soaked up the tranquil surrounds, we headed into the forest, and after a few minutes of walking arrived at a small two-storey hide. A naturalist put morsels of chicken on to the branches of the trees and within minutes the first ocelot arrived. Hushed gasps followed as we all took this marvellous scene in, trying to take a picture that would do justice to this wonderful little cat. Then another ‘alpha male’ ocelot arrived and the first ocelot retreated into the background where she stayed for some while making loud noises. After some while she came out again and we had wonderful views of both cats. Wed 11th - Early breakfast then 2 hour boat excursion on the Pixaim River; visit one or two wildlife-viewing towers in the lodge grounds. Nearby is a nest of habituated Jabiru Storks. Check out by 9am and make the 3 hour drive to Cuiabá for flight to São Paulo. Own lunch After an early breakfast, we took a 2+ hour boat trip down the tranquil Pixaim River to soak up all of the colourful bird life. A brief landing allowed us to enjoy excellent views of a statue-like Great Potoo at its day roost. After thanking the friendly staff, we were soon on our way, heading northwards back to Poconé and subsequently, Sao Paulo. 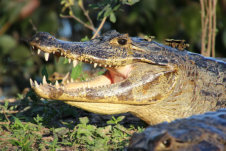 Along the way the 'usual suspects' were all out in force – Yacaré Caiman, Capybara and the massed ranks of waterbirds. From Poconé, and subsequently the larger city of Cuiabá, which marked the end of the wildlife experience and a return to the UK (via São Paolo) for most. However, we stayed the night in Sao Paulo for our onward excursion. Thur 12th - Following a 90 minute flight we were picked up from airport by a driver and guide. We checked into the Belmond hotel which is within the national park and then went on a 2hr walking guided tour of Brazilian side of Falls. We then spent the rest of the afternoon exploring on our own. 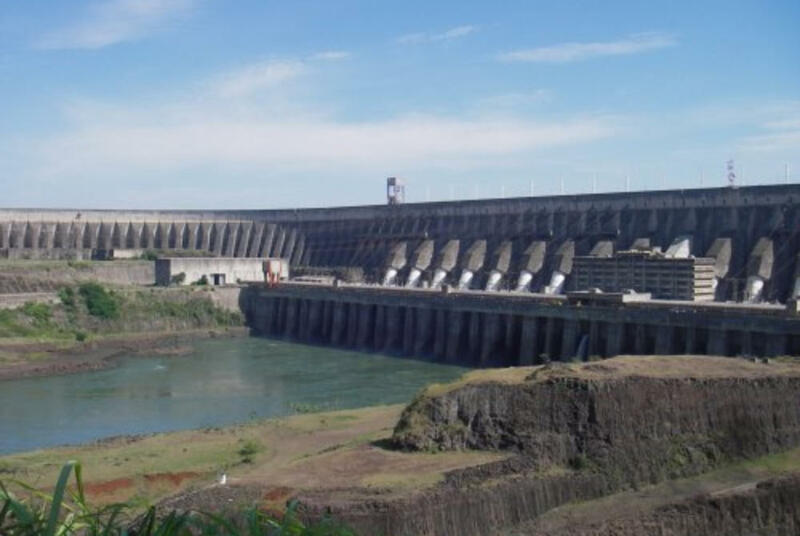 Fri 13th - at 8am we set off on a customised private tour to the Bird Park then into Paraguay to visit the Itaipu Dam (the largest output of power in the world). 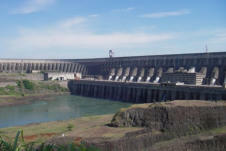 The dam spans the Paraná River between Brazil and Paraguay. It started generating power in 1984. Co- built by both countries it is the largest operational hydroelectric energy producer in the world, generating sufficient to meet worldwide power consumption for two days. About 90% of the power generated is used by Brazil. Then we travelled on to Saltos del Monday (the “younger brother” of Brazilian’s Iguazu Falls). where we had lunch overlooking the falls. Then back into Brazil to visit the Three Borders Landmark at sunset. Sat 14th - Set off at 77.30am to cross over into Argentina to see the falls. We trekked the Green trai and Lower trail and then took the train to Devils Throat, the most impressive and powerful part of the Falls. We trekked back along the Upper trail. Arriving back in Brazil we stopped by the roadside to have a beet juice. The juice was extracted by pushing the sugar cane in a mangle (wringer). We then went to the airport for our flight to Rio. Rio De Janeiro Sun 15th - Guided city tour of Rio de Janeiro is a huge seaside city in Brazil, famed for its Copacabana and Ipanema beaches, The 38m Christ the Redeemer statue atop Mount Corcovado and for Sugarloaf Mountain, a granite peak with cable cars to its summit. Our room in the hotel overlooked the Copacabana beach. During our tour we visited: Christ the Redeemer statue, Metropolitan Cathedral, Municipal Theatre, Aquaduct, Coloured Steps (Selaron Steps), 1st Royal Palace, Placo XV, Old Cathedral, Cultural Centre, Future Museum, Olympic Boulevard to see the largest street art mural in the world, Sugar Loaf Mountain. We enjoyed dinner in the quirky Marius Degustare Restaurant with its good collection of Maritime items hanging from walls and ceilings. There’s a large choice of buffet and the waiters walk around with plates of the hot fish and meat, serving each table as they need food. Mon 16th - We took a taxi and visited the superb Botanic Gardens with its beautiful, massive plants. All too soon it was time to leave and return to the hotel to be taken to the airport for our flight home. Journey to South Wild Wolf Camp We passed cerrado woodland and patches of ‘caatinga’ (scrub land) thorn forest, with some taller patches of ‘cerradão’ (dry forest) appearing in the last half-hour. Literally translated as ‘closed’, the ‘cerrado’ is a rich tropical savannah comprising a mosaic of habitats including forest, woodland, wetlands and gallery forest. It is the second largest biome in South America (after the Amazon) but is amongst the least studied and least protected. Journey to South Wild Cliff Camp We drove deeper into the Paranaíba Headwaters area to SouthWild Wolf Cliffs Camp, seeing Burrowing Owls en route. 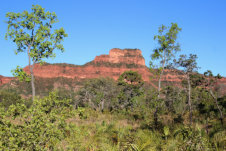 The scenery has views of stunning 1,000 feet tall, red sandstone cliffs, in which both Hyacinth and Red-and-Green Macaws nest. Transpantaneira Our jouirney from Cuiabá took us through 2 types of tropical dry forest of cerrado and cerradão to Poconé. 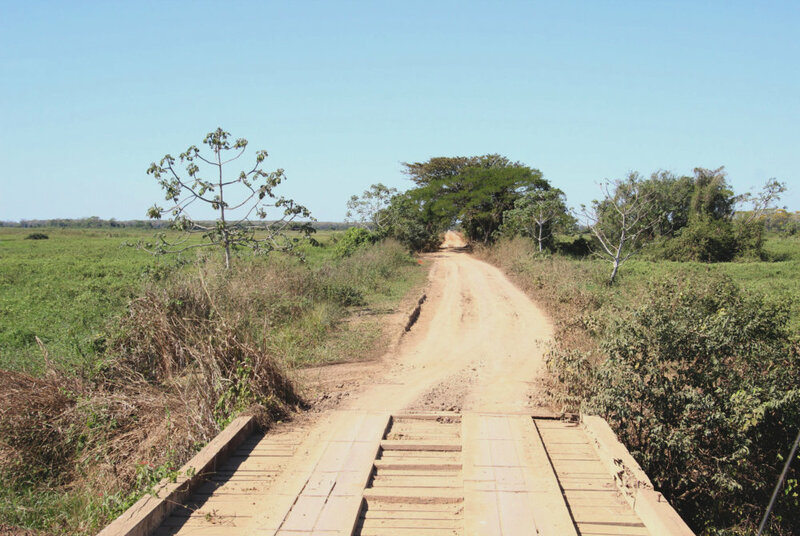 After switching vehicles we drove on the ‘Transpantaneira’,through the large flat floodplain of the Pantanal. The‘Transpantaneira’, is a raised dirt and gravel road, where there is abundant Pantanal wildlife - herons, ibis, Paraguayan caimans, and capybaras as well as over 122 rickety bridges! Yacare Caiman Thirty years ago the yacare caiman appeared to be heading for oblivion, ruthlessly hunted to supply a lucrative market for crocodilian leather. Their numbers dropped alarmingly but now they are protected and numbers have increased tremendoursly. 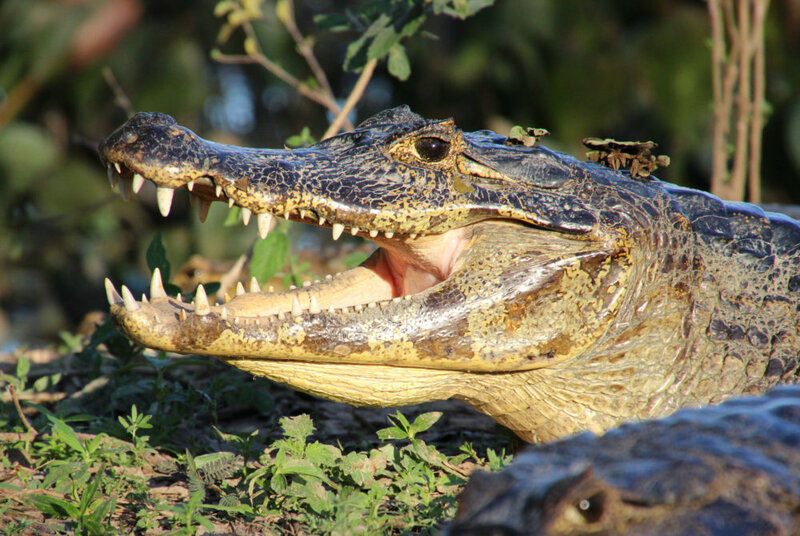 About 10 million individual yacare caimans now exist within the Brazilian pantanal, representing what is quite possibly the largest single crocodilian population on Earth. 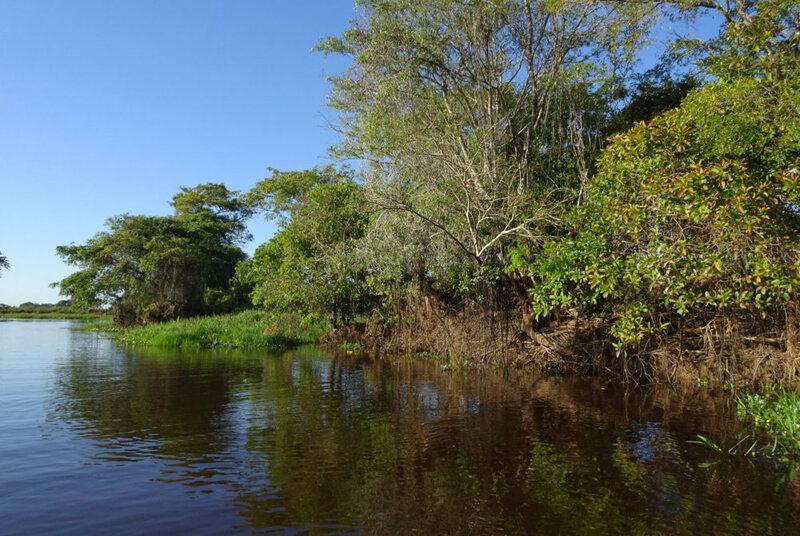 Rivers of the Pantanal Our focus was on the Three Brothers and Black Water Rivers, which were lined with thick vegetation, patches of dense tropical forest and rush-beds and sandy banks, with the various smaller channels branching into tight creeks. The scenery was superb, and the wildlife of the area proved equally impressive. 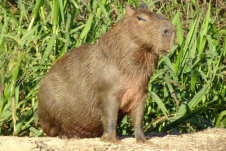 Capybara Capybaras are the largest of the rodent species. Weighing as much as a man, these oversized, pig-like animals are highly adapted to an aquatic lifestyle and even mate in the water. They are efficient grazers able to crop even the short, dry grasses left at the end of the dry season. They are capable of a range of vocalisations and can purr and bark. Like rabbits, they eat their own dung to extract maximum nutrition from their food. 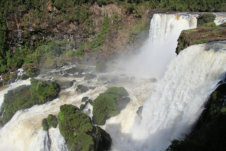 Saltos del Monday, Paraguay Anywhere else in the world the beautiful Monday Falls would be a major tourist attraction. These 45 m tall and approximately 120 m wide falls are truly breathtaking but they are overshadowed by one of the largest waterfalls in the world - Iguazu Falls Paraguay gained independence from Spain in May 1811 when all foreigners were moved out and the land redistributed. It is landlocked and they move most things by river to the coast in Uraguay. Paraguay was forced to cede territory to Argentina and Brazil including land around Iguazu Falls in 1870 following the deadliest and bloodiest inter-state war in Latin America's history, known as the "War of the Triple Alliance". Itaipu Dam The dam spans the Paraná River between Brazil and Paraguay. It started generating power in 1984. Co- built by both countries it is the largest operational hydroelectric energy producer in the world, generating sufficient to meet worldwide power consumption for two days. About 90% of the power generated is used by Brazil.